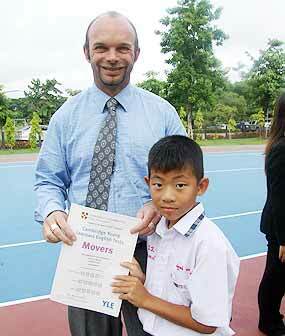 Mr. Jon Glendinning, Honorary British Consul in Chiang Mai expressed his pleasure when presenting local students with their Cambridge Young Learners certificates at the Waree Chiang Mai School. The certificates were given to students that passed their English testing and language capability. Congratulations to all the recipients! Students from the Waree School got a chance to visit and learn up close several of His Majesty the King’s sufficiency projects. 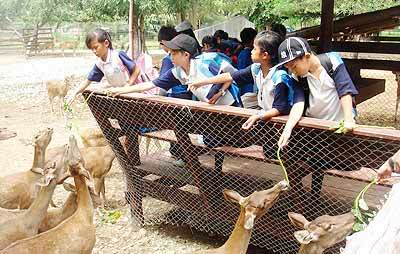 They traveled to the Theeweechon Botanical Park in Doi Saket and also toured the Prempracha ceramic factory in San Kamphaeng. Wanting to make a difference in the world, fifteen students under the supervision of science teacher Mr. Martin Foakes have launched a new environmental group at Chiang Mai International School, calling themselves the CMIS Planeteers. The Planeteers were already bubbling with innovative and exciting projects after their first meeting, during which they came up with ideas such as going to local grocery stores and talking to shoppers about trading plastic bags for environmentally friendly cloth ones, and planning their own Forty Hour Focus, a two-day program at the end of this month in which the Planeteers (along with anyone else who wishes to participate) will spend forty consecutive hours raising awareness in the community about global warming and living in a more environmentally friendly way. As a community, we need to pay heed to these young voices, and we should seriously consider the environmental problems that are facing Chiang Mai today. The Planeteers are making their move. How about you?